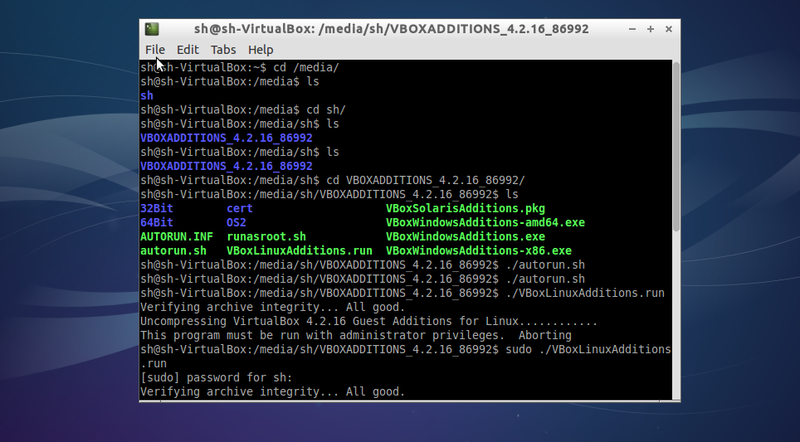 /usr/share/virtualbox/VBoxGuestAdditions.iso on the machine Sandbox. Would you like to force mounting of this medium? I struggled with this for about 2 hours on a Windows 7 host running Ubuntu 13.10 Server guest. In the end, I just copied over the VBoxGuestAdditions.iso to the guest (using WinSCP), mounted it, and then ran VBoxLinuxAdditions.run from the guest. Locate VBoxGuestAdditions.iso on your host (in my case, C:\Program Files\Oracle\VirtualBox\VBoxGuestAdditions.iso). Copy VBoxGuestAdditions.iso to your guest (in my case, I used WinSCP). Better doing what I have listed above instead of wasting time and putting faith in methods that may or may not work on your particular configuration. I stuck with the same problem. Removing and adding iso in virtualbox anew didn't help me too either. As result additions were successfully installed (at least terminal said so), but I didn't notice any improvements after installing. Eject the image while VM is running then retry. Works like a charm. Just an update - 14.04 LTS guest on a windows 8.1 host. Display by default was not correctly set on the new machine... I could not change the resolution. I went to install guest additions ( as recommended fix from oracle), but received the same unable to mount error. I opened the explorer, and noticed that the file was mounted, just autorun did not work. I just went to the drive and ran the program. was prompted for credentials, but everything worked. Go to oracle VM virtual box manage -> settings -> storage. Delete the mounted .iso file under controller: IDE, and then add an empty disk. Start Ubuntu and go to Device -> Insert Guest Additions CD image -> browse to the .iso file you'd like to mount and then install. After installation, reboot Ubuntu and the screen should be adjusted. It was important to understand - are guest additions working for any 1 VM and not for a particular VM. If yes, then the above will work. I got it installed - Go to VM Manager -- select the VM -- Select Storage -- Controll IDE Select the icon with + sign "Add CD/DVD device" Add the VBoxGuestAdditions.iso from Programs\Oracle\VirtualBox Boot into Ubuntu on VM Open files and Select the CD under Devices I had an option to run the CD on top right. But it is same as running the autorun.sh file. Let the installations run. Shutdown ubuntu VM Go to VM Manager and remove the disk. Boot into vm and it should be in full screen mode. Good luck!! !